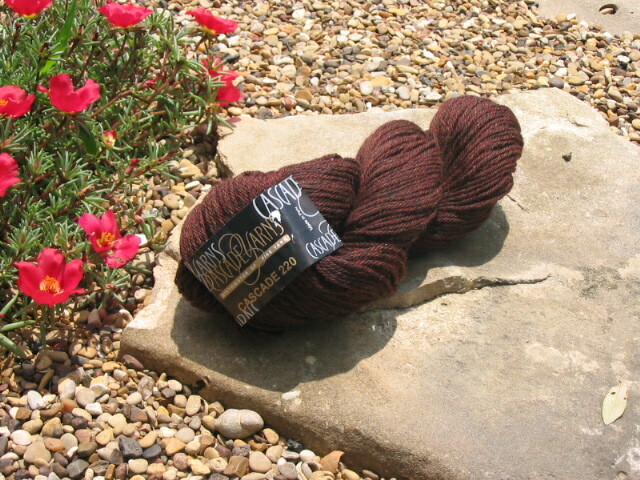 Looky what I picked up at the post office: A pretty new skein of Cascade 220 from my One Skein Secret Pal. The color is absolutely gorgeous--a deep brown with hints of red. I can't decide if this is a marl or a tweed. Maybe it's a mweed. Or a twarl. I know this is a yarn that is considered to be sort of a standard for knitters, a workhorse of a yarn due to its quality, felting abilities and assortment of colors. And yet, I've never tried it! I always wanted to, but I think I was overwhelmed by the color selection. Now I just have to think of a suitable project for this puppy. It's a perfect color for a teddy bear, but I don't think I'd want to felt it. It might muddy up the color too much. I think I'll have to go look at some of my pattern books for non-felted bears to see what I can come up with.